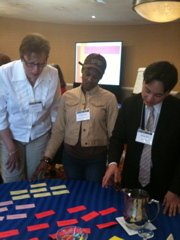 Consumer Action and Capital One co-hosted MoneyWi$e CBO and banker trainings in the mid-Atlantic. MoneyWi$e curricula includes: brochures, leader’s guides, power point slides, lesson plans and activities. MoneyWi$e was developed by Consumer Action in partnership with Capital One. Arriving just as Spring reached the East Coast, Consumer Action’s Outreach Team traveled to the Mid Atlantic in April, providing MoneyWi$e financial literacy training to community-based organizations and financial service providers. The team conducted full day trainings for community group staff in Greenbelt, MD and Silver Spring, MD on timely topics such as establishing good credit, rebuilding credit and money management. The team also conducted a half-day training for bankers at Capital One’s headquarters in McLean, VA. In Greenbelt, the Outreach & Training team successfully trained 39 community-based organizations. Of the 39 participants, 83% of those surveyed answered that they have sufficient understanding and confidence to teach financial education to low-income adults using the MoneyWi$e materials. Community Outreach Manager Linda Williams led the Money Management session. Williams had the audience break into groups and work on a case study of a fictional client, Sally Walker. The teams did not realize that Williams was guiding them on a journey through the Money Management session while giving them hands on training in case management. After the teams presented their plans to the rest of the group, Williams went through the Money Management training slides and showed participants areas that should be considered in developing Sally’s case management plan. Community Outreach Manager Nelson Santiago led the session on Understanding Good Credit. After the lecture, Santiago had the participants to break into groups for a timed activity that tested audience knowledge on the topics presented in the module. The last session of the day enabled the group to receive hands-on training in presenting small segments of the Rebuilding Good Credit, module to a live audience. The audience was broken down into teams. Each team was given a section of the Power Point slides to study along with a lesson plan, brochure and leader’s guide. The teams were charged with delivering the materials to the rest of the group however they deemed fit. The purpose of the exercise was to demonstrate how trainers can digest the MoneyWi$e materials quickly and successfully deliver the information to their target audiences. In Silver Spring, Consumer Action trained 33 participants, which included a mix of long-time and newly trained financial educators. Of the 33 participants, 85% of those surveyed felt that the training had an appropriate mix of lecture, discussion among all trainees, and discussion among people at each table. The Silver Spring regional meeting followed a similar format of a combination of lecture and fishbowl exercises. A fishbowl exercise enables participants to test their knowledge of a subject matter by presenting to their peers. Because of Consumer Action’s commitment to making financial literacy training exciting and interactive, no two trainings are exactly alike. Capital One’s Community Affairs Team Member Bert Davis also facilitated a session on teaching adults at the two regional meetings. Davis provided both fact-based and anecdotal examples of how to effectively reach adults. In McLean, Consumer Action trained 68 Capital One bankers on using the MoneyWi$e Financial Education program to teach financial literacy. Of the 68 bankers trained, 66% surveyed answered that they had sufficient information from the MoneyWi$e training to help them to promote financial literacy in their market. 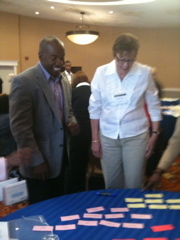 Community Outreach Manager Linda Williams trained the bankers on How Adults Learn. Williams helped equip the bankers for service by helping them to understand the motivations behind adult learning.